Katie and her husband have attended two weddings since their baby boy was born. Both times they took him to the church but not the reception. 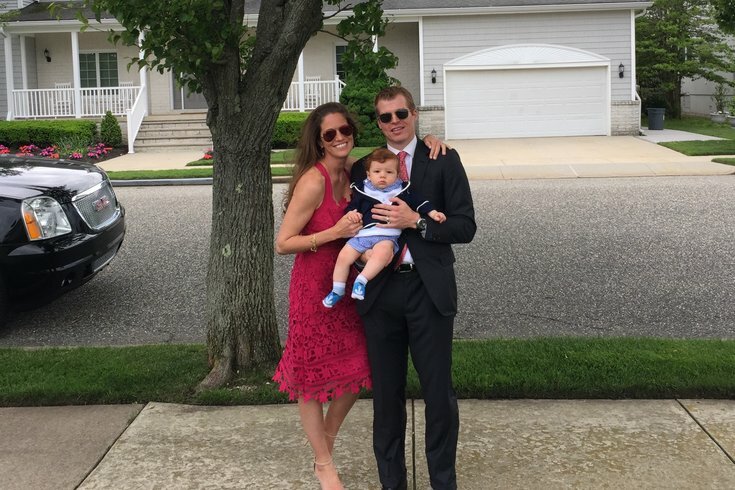 Last weekend, they celebrated the marriage of Katie's cousin Kelly to her new husband Chris in Avalon, New Jersey. My family and I had the great delight of attending my beautiful cousin Kelly’s wedding over Memorial Day weekend in Avalon, New Jersey. The ceremony was held at Saint Brendan the Navigator Parish, and the reception was in the beautifully restored Icona Golden Inn. The wedding was special not only because we witnessed the marriage of Kelly and her new husband Chris but also because family and friends gathered from near and far for a really fun celebration. This was the second wedding that my husband and I attended since our son was born. The first was last fall when Killian was 7 weeks old. My best friend Angela was getting married in the Adirondacks. Hers was truly one of the only weddings I would have attended with my newborn son. My young family and I were still very much in our nesting period, but Angela is my best friend of nearly 20 years, Killian and I were both in good health, and we were able to drive instead of fly. We took our son to the Catholic wedding Mass and sat in the back of the church so my husband could make a quick escape if baby boy started to cry. I know many people bring their babies to wedding receptions, but we did not feel it was right for Killian to be at the party. He was simply too young to attend a big, boisterous celebration, and the only children in attendance were in the wedding party. My husband very sweetly offered to hang with Killian in our cabin room during the reception, which was held at the beautiful lakefront resort where we were staying. I was able to go to our room and nurse Killian throughout the evening, which was important to me. The photos I have of Angela and her husband Benedict holding and kissing my young son during their wedding weekend are a treasure to me. I am so happy that my family was there to witness their marriage! I feel the same about my cousin’s wedding this past weekend. Kelly is one of my 29 first cousins on my mom's Irish Catholic side of the family. Because we are such a big family, there were always lots of babies at our family events. Especially from Kelly's family – she is one of nine kids! We knew that we would bring Killian to the wedding Mass but not to the reception. Other cousins who also have young kids decided the same. Without knowing any local baby sitters in Avalon, we contacted the venue in advance to see if they had any suggestions. They recommended Sitters at the Shore, and my cousin Maureen arranged for two baby sitters – a mother/daughter team – to watch the four kids in two hotel rooms. I was a little apprehensive about leaving Killian with a stranger, but knowing that my husband and I would only be a short elevator ride away gave me peace of mind. Our baby sitter, Patty, was wonderful! I felt very comfortable that Killian was in her care. He went to sleep in his Graco Pack ‘n Play in the hotel room at his usual bedtime, and Ryan and I left the reception around 9:30 p.m. to get him back to my parents’ house in Longport. I assumed he would wake up, but he stayed soundly asleep as we took him from hotel room to car to home. The wedding was a success for my family; we celebrated my amazing cousin and her new husband, and my baby boy was able to join for the ceremony and stick to his routine. For both of these weddings, children were not invited to the reception, but we were able to take our young son to the wedding ceremonies. With wedding season in full swing, here are some recommendations that can help inform your decision if you are considering bringing your children to a wedding. To bring or not to bring, that is the question. The Emily Post Institute says that your first and best clue to determine if your children are invited to the wedding is on the envelope of the wedding invitation. If it is addressed to Mr. and Mrs. Smith, it means that your children are not invited. If the invitation is addressed to the Smith Family, then all are included. It is uncommon for people to explicitly write on the invitation that children are not allowed at the ceremony and/or reception; however, they will be careful in how the invitation is addressed to make their preference clear. Many of the wedding ceremonies in my family are held in a Catholic church. Because babies and children are (in my experience) always welcome in church, it is common for young kids to accompany their parents to the church for the ceremony. For my cousin Kelly’s wedding last weekend, there were many children in attendance at the wedding Mass. Of course, it is always important to ensure that young children are not disruptive to the ceremony. When Killian started chatting up a storm during my cousin’s wedding, my husband took him to the soundproof baby room located in the rear of the church. If you are not sure whether or not it is appropriate to take your child to the ceremony, ask! Many brides and grooms want a family-friendly reception, and just as many say “No kids allowed!” Even if children are invited to a wedding, consider whether or not it is a good idea to bring them to the party. In addition to the wishes of the bride and groom, you should think about the well-being and comfort of your child. Many wedding receptions begin at 6 p.m., which is when my son’s dinner and bedtime routine begins. If there are a lot of attendees and music, the noise could be too loud for a baby’s sensitive ears. A happy medium may be bringing your child to the cocktail hour but not for dinner and dancing. Be prepared that you may need to leave early or exit the room if your child becomes tired or fussy. A wedding is about the couple; if your child becomes a disruption or needs to go to bed, then you need to leave. Many people have strong opinions as to whether or not they can or should bring their children to a wedding. Ultimately, the decision starts with the marrying couple’s preferences. If you have extenuating circumstances or feel strongly that you want to bring your baby or children to a wedding but children are not invited, ask the bride and groom (or bride and bride, or groom and groom) if they will make an exception. But be prepared to accept and respect their wishes. It is their special day and they get to orchestrate the kind of celebration that they want. If you are unable to attend because you cannot bring your child, then you should send your regrets and a gift. What are your thoughts on babies and weddings? Should young children who are not in the wedding party be included in a wedding reception? Share with me and other parents in the comments section below or tweet me @ThePhillyVoice and @KathleenEGagnon.